Nearest: Tube Station: Russell Square 264 yards (241 metres), Railway Station: London St Pancras Domestic 0.7 miles (1.1 km), DLR Station: Tower Gateway 2.3 miles (3.6 km), Motorway: M1 Junction 1 5.8 miles (9.3 km). An amazing 5 underground stations within 0.5 miles (0.8 km) of the hotel. The Mercure Bloomsbury Hotel London is located between Russell Square and Holborn with Covent Garden within walking distance. Convenient for accessing the City of London and its financial centre which is on the East side of Holborn. From this location you are a few minutes taxi from the Strand and the River Thames. Southampton Row itself is a busy main road commuter road, transport links are good via tube, bus and taxi. Also just on the southern edge of the area known as Bloomsbury, popular for budget prices accommodation. Nearest attractions include the British Museum (0.2 miles), Conway Hall (0.2 miles), Dickens House (0.3 miles), Sir John Soames House Museum (0.4 miles), Petrie Egyptian Archaeology Museum (0.5 miles), Pollocks Toy Museum (0.5 miles), British Library (0.5 miles), Ben Uri Art Society and London Jewish Museum of Art (0.6 miles) and the London Transport Museum (0.6 miles). A 4 star hotel in an area of central London known for its reasonably priced rooms yet within walking distance of the main tourist areas. The Mercure London Bloomsbury offers modern accommodation housed in a traditional Victorian building. All bedrooms are cotemporary in style with individual layouts. Each room is air-conditioned and has a private bathroom with steam free mirrors, rainfall shower and/or bath and heated towel rails. In each room is a flat screen TV with digital channels, tea/coffee facilities, bottle of water, heating, double glazing, hairdryer, laptop size safe, luggage rack, WiFi internet access, direct dial telephone, work desk and chair. Iron and Ironing board, Newspaper and baby cots on request. Daily housekeeping. 24 hour room service. Dean's Brasserie is on the lower ground floor and serves breakfast, lunch, snacks and dinner. English breakfast buffet to a varied a la carte menu and a choice of hot and cold buffet. Also serves coffee, snacks and sandwiches. Drinks can be enjoyed outside when weather allows. Dean's Bar is on the lower ground floor. Open to residents and non-residents and includes a dance floor. Range of drinks served in an air-conditioned environment. Pool table for guest use. Late bar for residents only. The Mercure London Bloomsbury Hotel has meeting room/conference room. Offers luggage storage and 24 hour reception. Wireless internet throughout. Smoking is not permitted in public areas or bedrooms. Mercure London Bridge: is 1.5 miles (2.4 km) away, has a guest satisfaction score of 83% and rates start from about £99. Mercure London Hyde Park: is 2.2 miles (3.6 km) from here, earns a customer rating of 79% and base rates begin at about £118. Mercure London Paddington Hotel: 2.2 miles (3.6 km), rated at 73% and with rates from around £114. Mercure London Kensington: 3.4 miles (5.5 km), rated at 72% and with rates from around £80. Compared to other London hotels: This hotel has been rated 80% by past guests. The London average is 80% and the average for 4 star hotels is 83%. Therefore this hotel is below average for its sector (star rating) . Mercure Hotels across the chain average 74% so this hotel is one of the better rated Mercure hotels. Milesfaster ranking: 450th from 866 London hotels, 2nd of 7 Mercure Hotels, and 208th of 328 four star rated hotels. Another to Consider: A similar hotel nearby (0.1 miles, 0.1 km) would be the 4 star Doubletree By Hilton West End, where rates start from £188 and which has a 79% guest satisfaction rating. For a hotel that offers lower base rates take a look at the Grange Portland Hotel. 0.1 miles away (0.1 km), has been rated at 82% by past guests and the hotels starting rates begin at about £75. Howabout an alternative hotel that has scores higher in guest reviews? Then the 4 Star Montague On The Gardens Hotel ticks many of the right boxes. The Montague On The Gardens Hotel is only 0.1 miles (0.2 km) away. The Montague On The Gardens Hotel has an extremely high guest rating of 98%, one of the best rated London hotels. 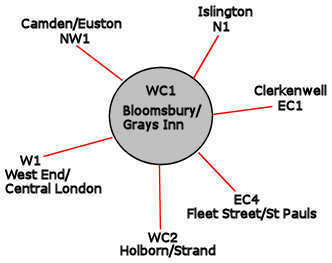 The fifty one hotels that are closest to this location (130 - 134 Southampton Row, WC1 postcode) which we list extend for a 0.5 miles (0.9 km) radius. Consisting of 5 five star hotels (average rating 92%), 23 four star hotels (average rating 83%), 15 three star hotels (average rating 79%), 5 two star hotels (average rating 71%) and 2 one star hotels (average rating 62%). Of the 51 local hotels top rated are Montague On The Gardens Hotel (4 star) and also the Covent Garden Hotel (5 star) (both joint top with 99%). Base Rates: We show you the average starting rates (base rates) in the area and break it down by star rating. Trouble with this is that base rates do not include special offers and limited low rate deals. However they remain a useful guide to general rates. The average base rate when considering all hotels in the surrounding area is £117 per night. Starting from £16 at Generator Hotel (2 Star, 77%) with top rates of £363 at Rosewood London Hotel (5 Star, 98%). Rate averages listed by star level: Five Star average: £257, Four Star average: £125, Three Star average: £88, Two Star average: £56 and One Star average: £53. We rank hotels based on their guest rating but balanced for their influencing factors and we rank Mercure London Bloomsbury 25th (joint) of 51 nearby hotels and 14th (joint) for the 23 four star hotels in the area. Compared to the nearest alternative hotels this hotel is 26th of 50 (8th of 23 four star hotels.) for base rates. Balancing the hotels rates and user rating we rank the hotel 27th of 46 when judging the balance of price point to user rating (Generator Hotel was top). Was called the Waverley House Hotel (3 star) till 13th December 2010 was it was rebranded as the Mercure Bloomsbury. The hotel was extensively refurbished during 2010 in all areas including all bedrooms.